The percentage of handheld device users visiting the Rubb Military website has been increasing by nearly 30% within the last few months. This is a significant increase from 21% for January to December 2015. To this end we are now launching our new responsive Rubb military website to ensure that our audience has the best experience when viewing the site on different screen sizes. After several months of development we are proud to unveil www.rubbmilitary.com, which automatically scales in size to suit mobiles and different sized tablets, as well as being suitable and available for desktop devices. 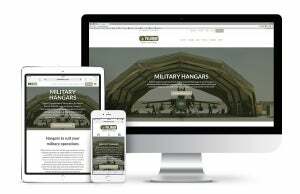 We took the information from the older static Rubb Military website and rebuilt a fully responsive website from the ground up, designed and built in-house, with the aim of providing a user friendly, functional and reliable site for our stakeholders and clients in the defence and aerospace sectors. Our users can now benefit from viewing webpages tailored to their viewing platform. This development involved a new contemporary visual design and the restructure of our website technology and coding techniques. The launch follows a trial and testing period of one month. In-house development, training and implementation, regarding the new types of coding techniques, were supported by local digital agency MediaWorks. Rubb marketing manager Clare Wilson said: "The original Rubb Military website was launched in 2010 and in September of that year 97.68% of people viewed the site via desktop devices and only 2.32% via mobile devices. In 2011 use of mobile devices grew to 3.41%, with use of tablets emerging at less than 1%. "Desktop use was still prominent at 96.23%. By 2015 growth of handheld device use had increased to 21% (13% mobile, 8% tablet). "This figure is now almost 30%, with the use of mobiles and tablets expected to continue to grow year on year. Continued development of responsive websites is now an important part of our ongoing digital marketing strategy." Rubb web developer Michael Halpin said: "Our new responsive website provides fast access to our refreshed, contemporary design at any time, whatever the device. Developing this in-house has been a rewarding experience that will also enable us to develop new features, updates and improvements regularly with our users in mind." Managing director Ian Hindmoor said: "We wanted to make sure our visitors enjoy the best user experience when exploring what benefits Rubb Military buildings have to offer when they are online, while ensuring that our content automatically adapts to the device they are using. "The overall result is testament to Michael’s hard work and creative skills in delivering something we are proud to put the Rubb name to." The Rubb marketing department will continue to develop and improve the site with new content and features for our readers.